Palisades Restaurant presents the 10th Annual Celebrity Chef Dinner on Saturday, March 30, 2019. The annual Celebrity Chef Dinner is the culinary event of the year and promises a sumptuous dining experience in a beautiful and elegant setting not soon forgotten! We’re bringing back some former celebrity chefs and pitting them against our own current and former chefs. Join us for a ten course meal benefiting the Giles Summer Lunch Program with winning dishes selected by you. Returning celebrity chefs include Jennifer Carroll, Blake Hartwick, Dana Herbert, and two surprise chefs to be announced. On The Palisades team are current chefs Tom Rambo and Bryan Poole along with former chefs Kevin White, Devin Giles White, Ashton Carter and Shaun Phillips. Held for the first five years as part of the James Beard Celebrity Chef Tour, The Palisades Restaurant has since taken the charity local, with proceeds benefiting the Giles County Summer Lunch Program. The program provides lunch for students during the summer months when school is out of session. Over 50% of students in Narrows and Pearisburg receive free or reduced lunch during the school year. The proceeds from the Celebrity Chef Dinner allow the program to offer healthier food choices and more extensive transportation services for those children living in outlying areas of the county year round. Celebrity Chef Dinner tickets are $150.00 per guest with tax and gratuity included. Tickets are expected to sell out quickly. To purchase tickets, call us at 540-626–2828. To view the event flyer, visit: https://i.imgur.com/YBwhOBC.jpg. 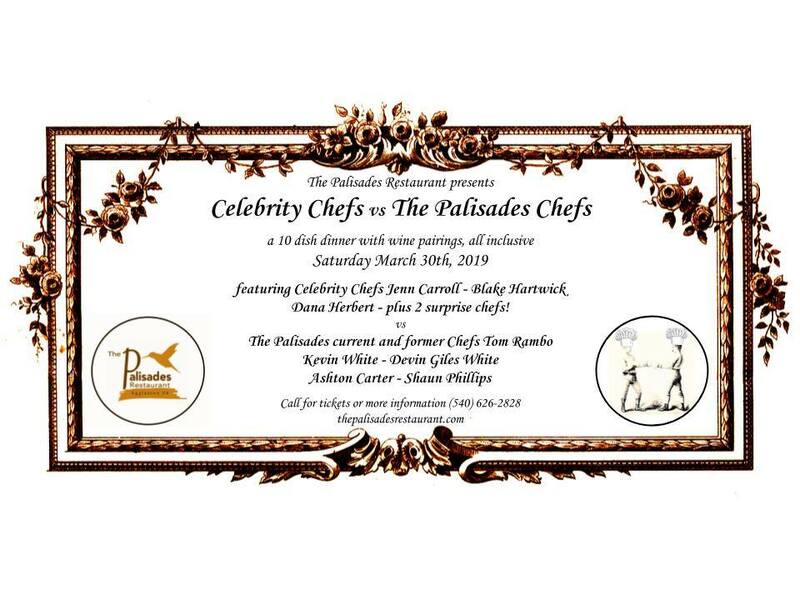 For more information, visit: http://thepalisadesrestaurant.com/event/celebrity-chefs-vs-the-palisades-chefs/ or https://www.facebook.com/ThePalisadesRestaurant or call 540-626-2828.